Although you understand how important HVAC maintenance is, you might not realize how important commercial air handling units are. Although you understand how important HVAC maintenance is, you might not realize how important commercial air handling units are. These components need to be repaired and monitored as often as possible. These units help create and maintain comfortable temperatures and improve the air quality inside your commercial building. Let’s learn more about them. All of these issues contribute to worsening indoor air quality, temperature fluctuations, and inadequate air flow. That’s why getting timely service is important, as are replacements when the original system has failed. Commercial air handling units, like commercial HVAC systems, will eventually wear out. Once they do, they will need replacing. Although the replacement process may seem confusing, when you work with the experts they will make it much less time-consuming so you can focus on running your business. With the right replacements, your company can save money over the next ten years, vastly improving your energy efficiency and putting you in a better position for the next time the air handling units need to be replaced. The replacement process involves several different steps. First, the new air handling units must be installed. Then they need to be started up to make sure that they will work. After the startup procedures are completed, further testing is conducted to ensure that everything is fully functional and that there are no parts that need further repairs. 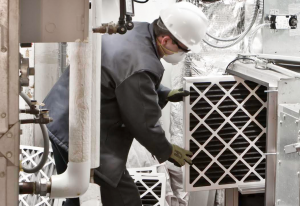 It’s also important to ensure that vibration analyses are completed so that the air handling units won’t shake too much and disrupt other parts of the delicate system. You’ll also want to make sure that the noise isn’t distracting or harmful to your employees and visitors once the new air handling units are up and running. This entry was posted on Friday, January 25th, 2019	at 11:13 am	and is filed under Efficent Commercial HVAC Systems . You can follow any responses to this entry through the RSS 2.0 feed. Both comments and pings are currently closed.